Prof. Garfinkel with possible ancient Israelite "shrine"
Interesting finds keep coming to light at Khirbet Qeiyafa, the site of the remains of a Davidic-era city near what once was the Philistine-Israelite border. Already this site has turned up a tenth-century BC ink-on-pottery inscription that none other than Emile Puech—a famous French scholar from the Ecole Biblique widely known for his early work on the Dead Sea Scrolls—has interpreted as a description of the rise of Saul to the kingship. 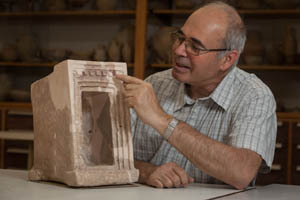 Now archeologist Yosef Garfinkel of Hebrew University is making known cultic finds from the site that shed light on religious practice at the ancient city. 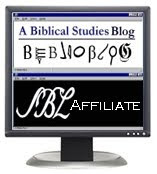 Don't be surprised if the cultic materials that are discovered reveal syncretism or pagan religions being practiced in an Israelite city, and don't be surprised if news articles spin the finds as "disproving" the biblical account of Israelite "monotheism." Actually, the biblical account asserts that monotheism (I'm not going to argue the technical definition of that term—I am aware of the debate) was introduced early in Israel's history but was mostly a "minority position" through most periods of Israel's history, especially during the "Judges" period immediately preceding the monarchy. We should expect to find religious practice at Qeiyafa that is "deviant" by biblical standards.